I should be writing a review of a recently read book, I know, but although there a few of them on my night stand, dog eared and completed as summer reads, my appetite is also for pop culture's less reputable districts, movies, comic books, television. I confess, as high brow as I pretend to be , as middle brow as I more often come across as , my taste go lowbrow, pure and simple. The fast, forgettable pleasures of action movies sucker me in. It's a love that cannot die at least on my part, but it is not a love that is always returned. I had always thought that being a secret agent meant that you did your best to remain more or less anonymous while doing the dirty work a mission demanded. It should go without saying that being inconspicuous, the kind of person in public or in the work place others wouldn't take a second glance at, is essential to effective spy craft. Henry Cavill , portraying super spy Napoleon Solo in The Man from UNCLE, director Guy Ritchie's relaunch of the cult 60s TV spy drama, is , for an nominal espionage agent, a large conspicuous presence wherever he appears in this film. Leaving the plot aside , which is a weaker version of any number of heist films we've witnessed in the last decade, Solo is supposed to be a suave, well tailored American antiquities expert. Cavill, though, has a super-hero physique that looks, let's say, like it would be asset if we were wearing blue tights and a red cape. Here, though, the broad shoulders, wide chest and thick arms make all the expensive suits, shirts and vests look tight , constraining on him. Cavill, an Adonis by any other criteria, looks absurd here as the the unassuming, if alluringly naughty jet setter insinuating into the confidence of an enemy he is trying to wrest secrets from. At any moment in the film you expect to rip his shirt, split his pants and excuse himself, effectively useless, to the men's room . The credibility is helped no further when your partner , a surly psychopath in Illya Kuryakin, likewise doesn't blend in with the surroundings. Rather, Kuryakin, stands above it, a tall, figure constantly looking downward at whoever he's talking to. Where Cavill resembles a Herculean lounge lizard, Armie Hammer as Kuryakin looms like a tall, dead tree over an overdressed scenery. His acting is just as lifeless. The visages of both do not bode well for the kind of espionage that needs to be performed, even by the disbelief-suspending conventions of spy movies. Solo looks like a body guard being molested by a suit a half size too small for his broad frame, and Kuryakin hovers like a gangly , nervous father chaperoning his daughter's first date. Both are figures you notice and keep your eye on as long you're in the same room with them. If you were a rich bad person and noted these two lurking around your open bar and feasting off the buffett, you would ask your waiters to count and then lock up the good silver ware, after which you would instruct your henchmen to get ready to knock these guys over the head. That does not literally happen in this dreadful remake of a charming 60s TV fantasy, but surprises that don't surprise, twists that don't turn your head around, setbacks that seem more nuisance than threats to to the existence of mankind about through this movie's duration. Ritchie quite often tries to jazz things up a bit with some slick editing,arial pans of lovely Italian country sides and coastal villages, and generous portions of gun fire and explosions. 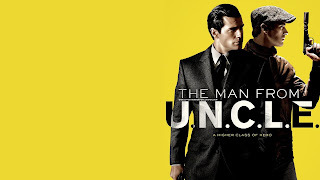 None of that rises The Man from UNCLE its tractionless tedium.